The 2018 Navigator makes a bold claim at the top of the luxury SUV segment. If you had a lot of what they call “disposable income” and you wanted to take the family on vacation, you might charter a plane. You would not pick something small, and instead might choose a gigantic 747. No, wait a minute. They’ve discontinued the 747, so we can’t charter one. 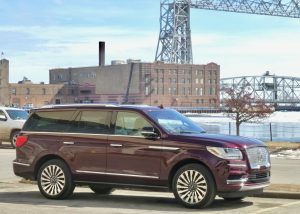 But then again, the Lincoln Navigator seemed destined to become a historical footnote a few years ago, too, right along with the Chevrolet Suburban and Tahoe, Cadillac Escalade, Ford Excursion and all other manner of humongous SUVs, because of our quest for improved fuel efficiency and better emissions. And now we seem to have forgotten all of that, and luxury-vehicle seekers are lining up to drop six-figure checks on the biggest, baddest and most luxurious trucks and SUVs on the market. With that, the 2018 Lincoln Navigator speeds onto the scene with power and all-wheel-drive grip, as if to declare itself biggest, baddest, etc. So maybe there’s hope for the 747, too. The only problem is, it appears that even auto journalists can’t decide what’s a truck and what’s an SUV anymore. Years ago, preparing for the car of the year and truck of the year awards at the Detroit Auto Show, I voted to not expand to add utility of the year as a third category. Nobody cared. My concern was that with a huge crop of mid and compact SUVs hitting the market, there might be years when a legitimate truck wouldn’t be coming out new, and leaving trucks with SUVs would keep the integrity of our votes intact. The decision went the other way, and this year we see the result: There are no new trucks, so the committee decided to make the Chevrolet Colorado midsize pickup one of three finalists, even though it was just a cladded-up, off-road version of an existing truck. 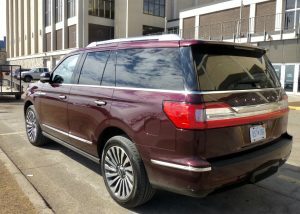 The other two finalists would be the Ford Expedition and Lincoln Navigator, both of which used to be large SUV by anyone’s measure. justification to evaluate them as trucks was they are body on frame. Wider, though a tad shorter than a Suburban, the Navigator is roomy throughout, including the third-row seat. Whatever. Turns out, he Navigator won truck of the year. 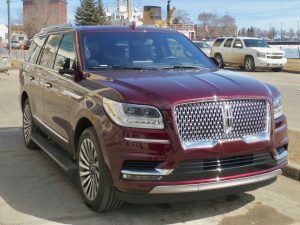 I remained a skeptic right up until a recent week when a new 2018 Navigator 4×4 Reserve was delivered for me to road test. It was shiny black, as anyone could tell from a glance out the window. Except it was not. Another illusion. When you got close, you could tell it was a subtle, not-quite-black, dark color, with some red to it. 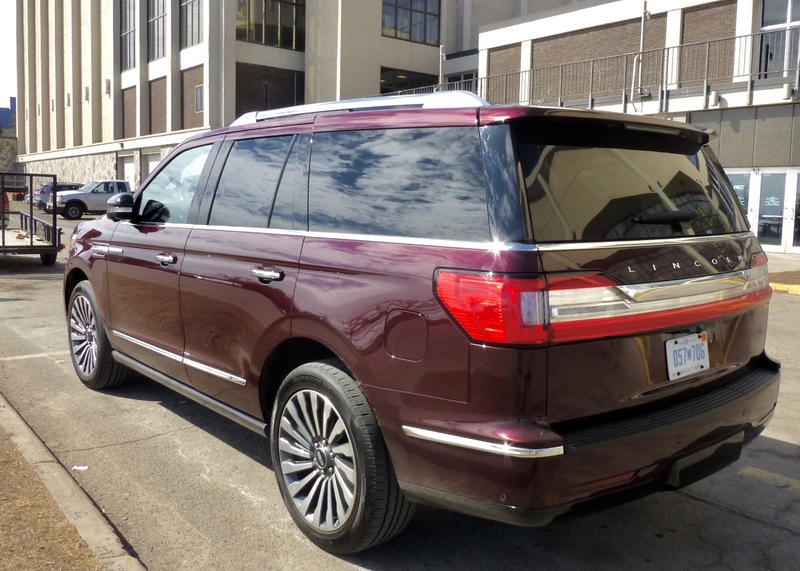 Officially, it is listed as “Burgundy Velvet Tinted Clear Coat,” and it was stunning, making the bright chrome grille and stylish 22-inch alloy wheels jump out at you. Your first impression is that this is a bi-i-i-ig SUV. Gigantic. It is so big that when I later saw one from a distance, the view from the rear corner made me think I was looking at one of those new extra large Suburbans. THAT big. Walk up and stand next to it and the Navigator will dwarf you. It is 76.1 inches tall, with a 221.9-inch length, 131.6-inch wheelbase, and a 79.9-inch width. At 6,330 pounds, the Navigator can tow 8,100 pounds of trailer. Part of its illusion of size, which is no illusion but more fact, is the flashy wheels are 9.5-inches wide and 22 inches in circumference. Now, we aren’t going to estimate the price, but let’s assume buying replacement 22-inch tires will cost more than a reasonable consumer might be interested in paying. However, I do have to restrain my usual sarcasm when dealing with trucks or SUVs I would normally accuse of being too big, because people are plunking down enormous quantities of money to buy these beasts. And the fellow in the White House is ordering his new EPA puppet to roll back former President Obama’s strict emission and fuel economy standards, to the applause of all the U.S. manufacturers who want nothing more than to unleash the largest of large trucks with the least economic of engines in a return to the 1970s, presumably. Clean and elegant inside, the leather and wood is in stylish abundance in the Navigator. Interesting, but one of the most impressive things about contemporary cars and trucks is that these companies continue to make higher and higher technology engines that produce more and more power yet still get more and more miles per gallon. Somehow, U.S. manufacturers would trade all that for cheaper-to-build, less-efficient engines that are more foul-running and will get worse fuel economy. The test Navigator provided a sticker sheet that discreetly neglected to list a base or as-tested price. 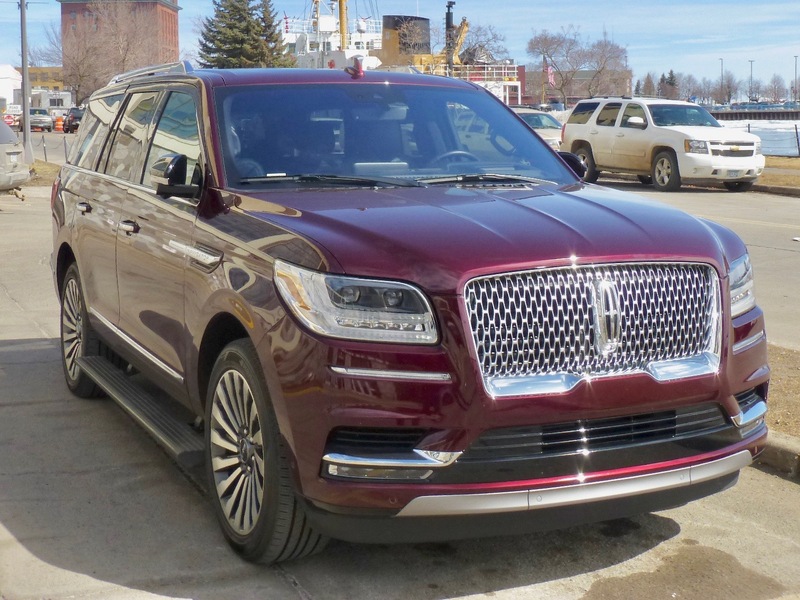 Checking a few car magazines, we can deduce that a Navigator will cost a base price of about $75,000 up to about $98,000, with gusts up to and over the magic $100,000 barricade. Seems to me, prices like that could make foreign-make engines and the vehicles that come wrapped around them more popular, simply because intelligent people might prefer 30-plus miles per gallon to 15. I got a top of 19 mpg. But we can just wait to see if the U.S. manufacturers cut the sticker prices of these giant SUVs once the EPA says they can make less costly engines. Continental grille recaptures various touches from Lincoln’s luxury car past. Ironically, companies like Ford have already made the plunge to high-tech, and they have done a good job, mostly. The Navigator, for example, comes with a 3.5-liter V6 EcoBoost engine, which means it is twin-turbocharged and can be tuned to turn out a lot of power. It is also used in the F-150 Raptor. The test vehicle shows 450 horsepower at 5,000 RPMs, and 510 foot-pounds of torque at 3,500 RPMs from its 3.5-liter V6. That is more horsepower than Cadillac can extract from the 6.2-liter V8 in its 6.2-liter V8. Once you open the door on the Navigator, you realize how happy you are to spot the grip handles to let you pull yourself up and in. That’s before you spot the moving running board that is coming out to meet you. Handy. 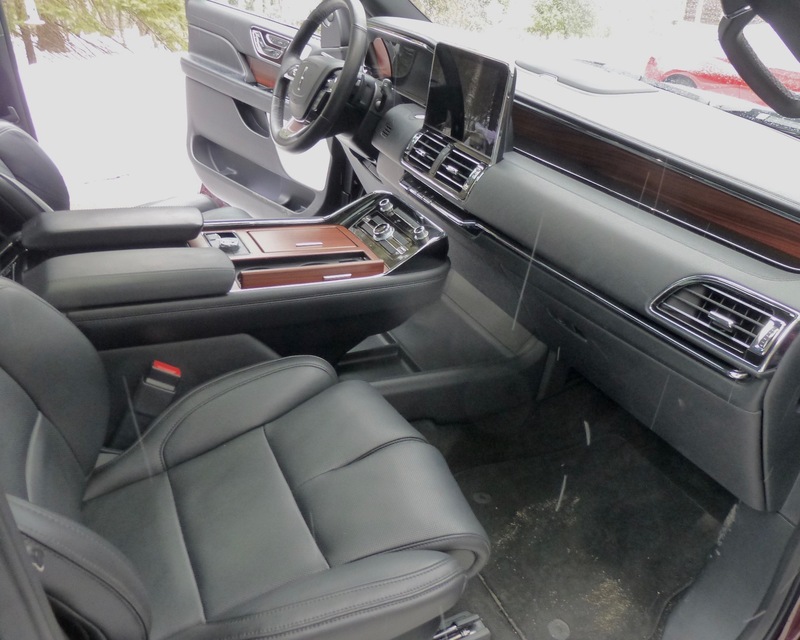 The black leather front bucket seats are wide and comfortably supportive, and as you settle into it and start fiddling with the 30-way electric adjustments of your bucket, you are also taken by the overriding feeling of luxury, which is everywhere. And then you push the button and start the Navigator, and all you need is someone to point to where the gearshift might be located. The 10-speed automatic with overdrive is shifted by a thin, horizontal row of push-buttons, located along the lower edge of the radio-navigation screen and above the lower dash-center stack-console area where you might expect to find a modern shifter. Worked great, though, once you got used to it and it shifted readily with the paddle shifters on the steering wheel. Second-row seats slide forward to allow easy access to the spacious third row. Driving the Navigator was easy. For such a big beast, it handled well and gave back only moderate sway, which you could eliminate by switching the mode switch from normal to “excite,” which tightens the steering, stiffens the suspension and holds shift points longer. A panoramic sunroof adds to the luxurious feel, but with all that room you also feel guilty if you have fewer than six occupants. 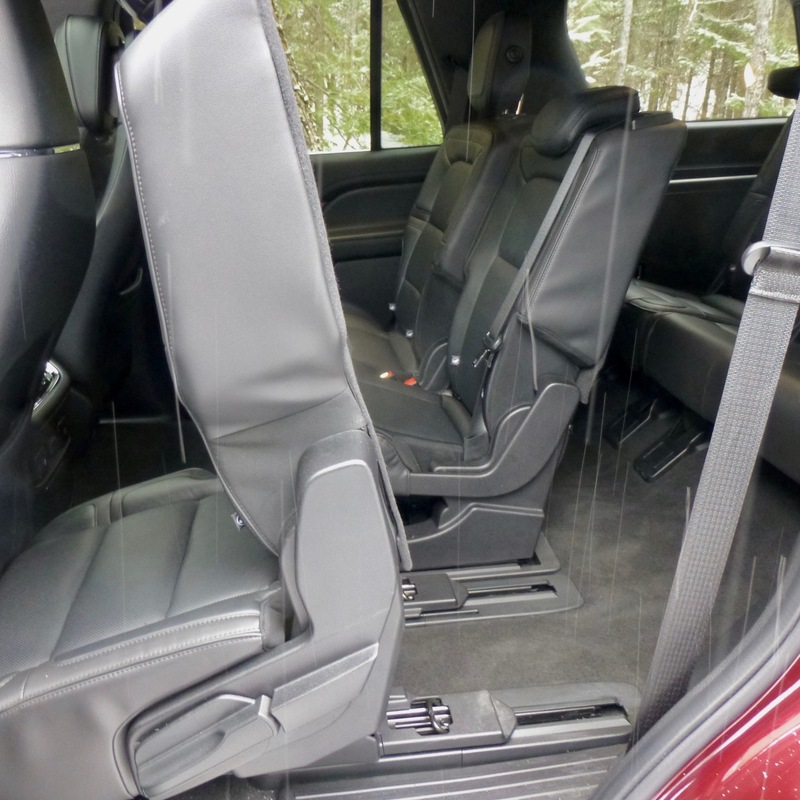 Opening the rear door shows off a roomy second row area, with a fold-down center armrest to go from three seats to two and a console. One of the neat features is that when you want to put someone — and we’re talking children or adults — into the surprisingly roomy third-row seat, you fold the outer second-row seat forward and it slides what seems like a foot forward, which presents an easy-access opening to hop through and reach the far rear. I had fun wrestling with the second-row seats, then I learned that there is a power switch that controls fold-tip-slide action. No wrestling is required. Ruggedness contrasts with the classiness of a family touring vehicle. 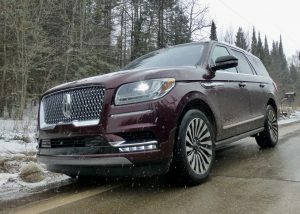 Naturally, the Navigator has all the latest safety gadgets, for lane warning and control, surround view of any and all things approaching from any and all directions, blind-spot alert, a 20-speaker audio upgrade, and all the connectivity gizmos you might want, including some things you didn’t know you wanted, like a wireless charging pad. What would you expect from the Navigator, which we can welcome as 2018 truck of the year in a year when big trucks are making a big — and we mean BIG — comeback.